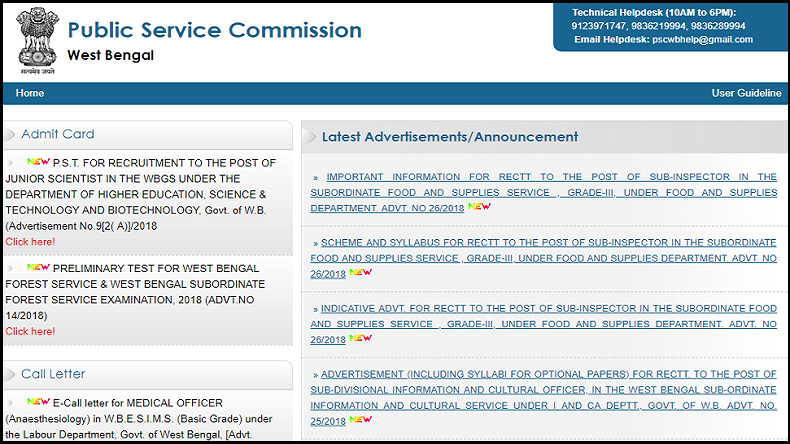 WBPSC recruitment 2018: Applications for the recruitment of 957 Sub-Inspector posts under the Food and Supply Department have been invited on the official website of West Bengal Public Service Commission. Candidates can log in to pscwbapplication.in and apply online on or before September 18, 2018. WBPSC recruitment 2018: West Bengal Public Service Commission has invited applications for the recruitment of 957 Sub-Inspector posts under the Food and Supply Department. The notification for the WBPSC Recruitment 2018 was released on the official website of WBPSC and online application process would be open from August 22, 2018. Interested and eligible candidates can apply through the official website pscwbapplication.in. Candidates should note that the last date for submission of applications for the Sub-Inspector posts is scheduled for September 18, 2018. Also, applications can be submitted only through the online mode at www.pscwbapplicati .in. According to the notification available on the official website, the examination for the recruitment will be held in two successive stages and candidates can read the detailed instructions by clicking on the links given below. Applicants must have passed Madhyamik Examination or equivalent under the state Board of West Bengal and must be able to read, write and speak in Bengali, as per the qualifications prescribed in the official advertisement on the website.